Homeowners often overlook garage security, but it is actually one of the most important areas of your home to secure. Even if you don’t keep your car in your garage, it’s a good bet that you have a multitude of expensive tools and equipment stored there. In addition, many garages offer a way to enter the home, through a door that is often much less secure than the main entrance to the home. 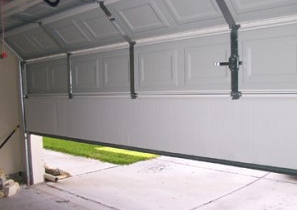 Many people ignore the security of their garage door because they don’t realize how important it is. Does your garage door close and lock securely? Many garage doors are made of cheap materials. Combined with their large size, this makes the garage one of the easiest areas for a burglar to break in. If your garage door has cracks, loose panels, broken panes, or other weak spots, have it replaced before a criminal pries it open. If you don’t lock the garage door securely, any stranger could just roll up your garage door and steal your belongings. If there are any windows in your garage, keep them locked too. If you have a door between the garage and your home, keep it locked so that no one can slip from the garage into your home. This door is a common entry point for criminals. Homeowners often don’t consider it a threat because it’s an interior door, and therefore it often isn’t protected it with a sturdy lock. Security experts advise you to make the door from your garage to your home as secure as the front door of your home. Never leave the garage door partially open for airflow in the summer, or when leaving for any length of time, even if you’re just running up the block to the corner store. Even if you are home, leaving your garage door open is risky. In many cases, those inside the home will have no idea someone is ransacking their garage until it’s too late. Keep the door closed even if you’re around to watch it. Leaving it open gives an opportunity for potential burglars to scope out your belongings, and come back later to break in and steal them. In addition, burglars know that these areas are nearly always unoccupied at night, making them a relatively safe prospect for a home invasion. A new trend that is becoming increasingly problematic is gaining access to the home through stealing the remote garage door opener. If this ever happens to you, change the frequency and code to your garage door opener immediately. Although such a device often makes more sense than a traditional lock on the garage door, it does present some unique security concerns. Having good home security outside the house can prevent someone from entering the garage as well as the rest of your home. 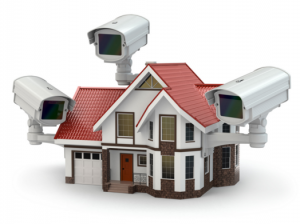 Effective strategies include outdoor lighting, dummy cameras or security cameras mounted in the eves of your home, and signs alerting potential burglars to the presence of a security system. There are plenty of ways to make the exterior of your home and garage less attractive to burglars. Whether you have an attached garage or a freestanding building, garage security is often overlooked, yet it is essential to the overall security of your property. An R-value rating is what determines how well the door will protect from the elements. If you live in an area with consistently high temperatures, then a door with an R-value rating of 15 or more should be used. This is especially true if you cool or heat your garage. If you live in an area that has a milder climate, then you can get by with a rating of 6 or so. 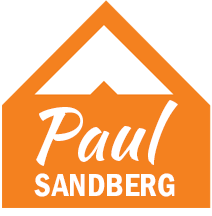 Think about what you want your garage to do. If you want to get into a nice warm car in the winter, then make sure you get a good rating for that type of temperature. 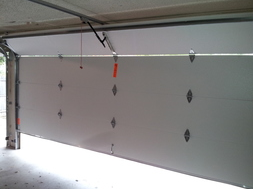 Even cheap garage doors should require little maintenance. Those made of wood may require staining and painting, while prepainted doors or artificial wood doors will look great year after year. This may not seem like it should be of much importance now, but when you’re painting the door a couple of years from now, you may wish you’d have gone with a more maintenance free model. One of the best places to start your search for cheap garage doors is the internet. There are several websites that offer good quality doors dirt cheap. Make sure you keep in mind that shipping may be expensive and you may have to pay someone to install it. Best of luck finding a great deal on cheap garage doors!